Eleven beds were shaped and tilled before we started on Tuesday. I finished the final till on the rest of the field that afternoon and gave myself a crash course in bed-shaping after everyone else had left. I like to remember that this area was a forest of cover crop just a few weeks ago, was mowed mid June, tilled under maybe last week, and is now already being shaped. I wonder how all the soil life is handling this rearrangement. On Wednesday, the youth crew amended the eleven newly shaped beds with wheelbarrows and shovelfuls of dairy manure. One of them spent the afternoon with a dust mask on, throwing handfuls of lime down the beds until they looked dusted with powdered sugar. 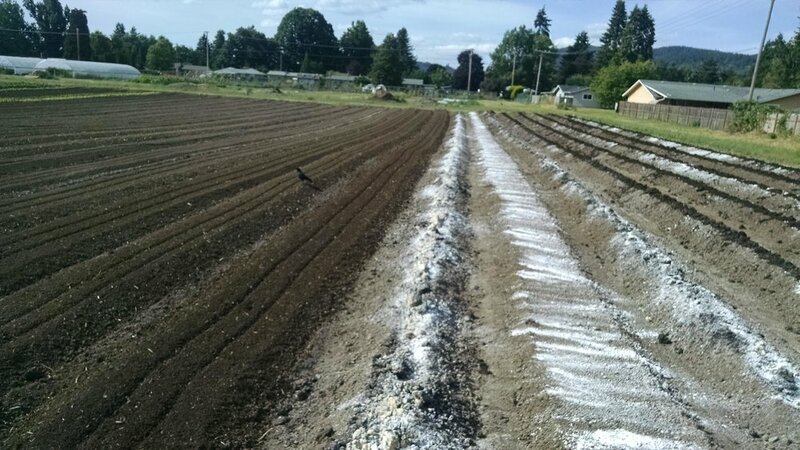 I must have tilled them in later that day, making less-than-straight lines for the drip tape atop perfectly flattened bed tops. Thursday I hoped to have them all ready to plant, but it wasn't to be. A few youth farmers pulled drip lines into the beds in the morning, and Michael and Phil spent all afternoon setting up the new system. New header, lengthened lines, rebar at the head of each bed to hold the header in place, staples at the far ends to hold the lines in place, a few repairs once the lines were running. There were a lot of spritzers, but seemingly nothing the plastic won't contain. I left the lines on for several hours in the evening to get the soil ready for transplanting. And today, the final step before planting: landscape fabric for the melons and plastic mulch on all the cucumber, zucchini, and winter squash beds. They're both projects that need my full involvement, and I take two focused youth farmers with me to start. Forget harvest. Kiya, David, and Jen can make it happen. I'm out on the final frontier all day, spreading melon fabric, organizing plants, showing people how to care for the delicate root balls, on the tractor with two people pulling plastic down the bed. Back at the nursery, measuring cupfuls of Surround (a clay-based squash bug barrier spray) into a giant spray tank I've never used, spraying the hell out of a truck full of melons as someone sways back and forth with the tank to keep the clay suspended. Checking in with Kiya about radish bunch size, asking a couple more youth farmers if they're available to come in tomorrow, handing out paychecks as they all leave. Just like that, game over. David and Isaac with one more bed to go!! David, volunteer Isaac, and I finish the plastic after everyone else has left for the day. David plugs in the last half bed of zucchini plants while I turn on more sprinklers. I'm disappointed that we didn't finish it today. And at the same time, looking back at all the steps it's taken to get to this point-- the plants can just go in the ground now-- finally, so simple!-- I'm humbled by all the energy it takes. Humbled by what we attempt, and proud of what we do.